Kelly Vance’s new book “The Best Laid Plans” is a nail-biting, sit on the edge of your seat mystery of the abduction and extortion of two young boys. Recent release “The Best Laid Plans” from Page Publishing author Kelly Vance is a gripping mystery that will leave its readers in suspense! Will the boys make it out alive? Kelly Vance has completed his new book “The Best Laid Plans”: a gripping and compelling mystery adventure of two young boys abducted and extorted. Will they survive? Will their baseball coach find them first? The reader will be on the edge of their seat until the very end! Kelly Vance, is a nationally known toxic torts attorney with a proven record of success in over thirty years of practice. Kelly's passions are his three adult children, who are turning out better than he ever deserved, and teaching kids how to play baseball. Kelly enjoys writing and has written many articles on legal subjects, and contributed to the legal texts. This is Kelly’s first work of fiction. Published by New York City-based Page Publishing, Kelly Vance’s thrilling tale enthralls the reader leaving them wanting more. Will the baseball coach be the hero? Will the boys survive? Will their parents give in and pay? This exciting mystery captivates audiences from all backgrounds. It was a good plan, but maybe too good. Victims of an elaborate plan to extort money from their families, two young boys, Danny Ryan and Tommy Mathison, are abducted and held for ransom. Before the local police can even launch an investigation, Danny’s baseball coach stumbles onto a clue. Instead of welcoming the assistance, do the police suspect he is the kidnapper? Frustrated by the authorities’ slow progress, the coach runs his own investigation. But as several suspects emerge, which one is the kidnapper? And will the boys be found unharmed? Danny and Tommy rise to the occasion and try to escape from captivity. But as the days pass, and their efforts fail, they are in danger of losing hope. Meanwhile, the boys’ kidnapping has a sobering impact on their families, Danny’s teammates, and the local community in general. Note: While this is a work of fiction, the championship game action is genuine, and is lifted right out of a 2011 league championship game. 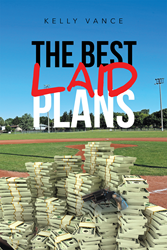 Readers who wish to experience this gripping work can purchase “The Best Laid Plans” at bookstores everywhere, or online at the Apple iTunes store, Amazon, Google Play or Barnes and Noble.